The purpose of police custody and judicial custody are the same as both detain the accused person and restrict him not to interfere with the process of investigation. 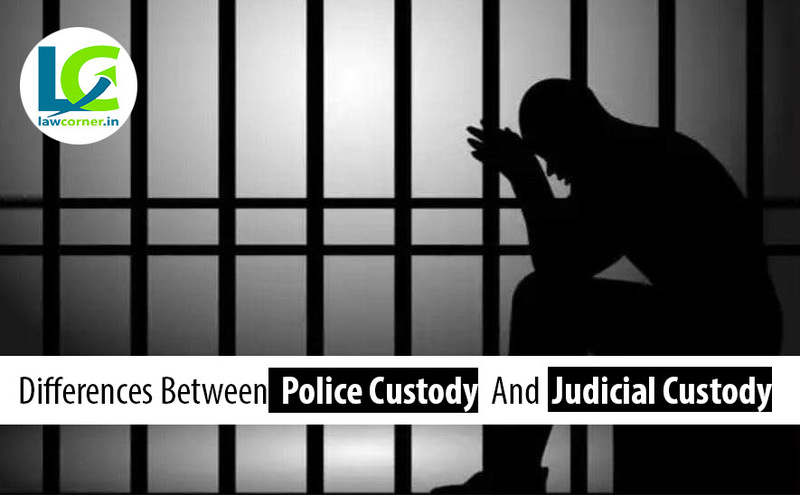 Both police custody and judicial custody are different from each other despite being connected to each other. Suspicious in both are kept in the custody of the law. Both types of custodian have to stop the person from committing a crime. An accused person is kept in police custody and judicial custody according to the rules of the Code of Criminal Procedure, 1973 (CRPC). Whenever the police take custody of a person, then he may seek time to keep custody of the magistrate under section 167 of CrPC for 15 days for further investigation. A judicial magistrate can send back any person to the police station for further inquiry and investigation for the period of maximum 15 days. But there are some such laws under which the police can keep an accused in police custody for 30 days. As per the Maharashtra Organized Crime Control Act of 1999 (MCOCA), police custody can be extended up to 30 days. When the police receive information or complaint/report about any person, the concerned police officer arrests the suspects involved in the crime so that the person can be prevented from committing further crime. When such a suspect is locked in police custody, then that is called police custody. During police custody, police officers in charge of the case can question the suspect, keeping in mind that the suspect’s custody period should not be more than 24 hours. In this case, the police officer involved in this case is responsible for presenting the suspect before the appropriate judge within 24 hours and presenting evidence against him. What is the meaning of judicial custody? Judicial or judicial custody means that the person will be kept in prison on the order of the relevant magistrate. But a person is not kept in jail in police custody. You must have heard that the court has sent the accused to 14-days judicial custody. In police custody, the police officer detains any offender or suspected person under his custody as an action taken by himself, but in Judicial custody, the accused person is kept in jail upon the order of the concerned magistrate. A person lodge in police custody has to appear before the concerned magistrate within 24 hours but the person detained in judicial custody is kept in jail until Court gives bail. Police custody begins when a police officer arrests a suspect upon receiving a complaint or FIR. Whereas, the Judicial custody begins when the public prosecutor satisfies the court that for the purpose of the investigation, custody of such accused is necessary. The maximum period of police custody is 24 hours and which may be extended to 15 days as a whole by the appropriate magistrate Whereas in Judicial custody the maximum period of detention is 90 days where the investigation is related to offenses punishable with death, imprisonment for life or imprisonment for a term not less than ten years and 60 days where the investigation is related to offenses punishable with imprisonment for a term less than 10 years. Police custody is under the security provided by the police whereas in judicial custody the security is provided by the judge/magistrate.